How Much Does It Cost To Develop A Newspaper Mobile App? The newspaper sales have gone down ever since the media decided to have their own news mobile apps. To be precise, 7% drop in sales in 2015 and the percentage is predicted to be even more in the present. According to a survey, an average user spends 2 hours on phone to check news updates. Mobile phones have been around for a while now but mobile apps have taken over the human lifestyle. In America, only 2% of the population said they read printed newspapers and find it useful. 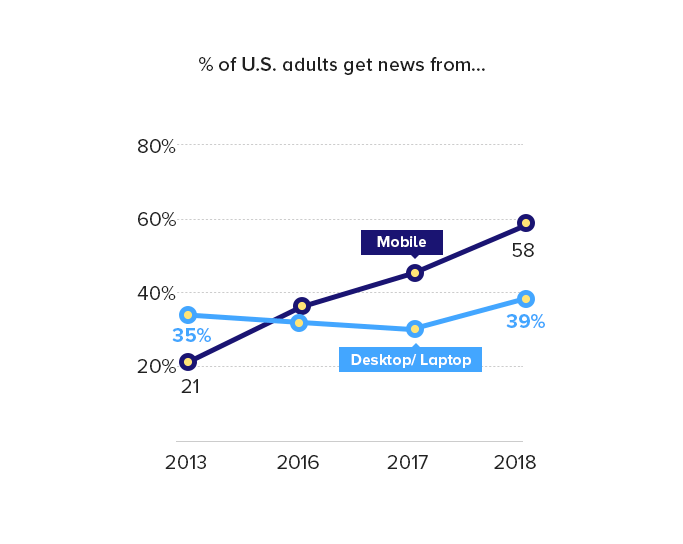 The majority of the population either don’t read the news more often or reads it on a digital platform. In India, the readership of print media has decreased as per May 2017 reports from the Audit Bureau of Circulation (ABC). Same is the case with countries such as UK, Germany, etc. The stats above shows the readership of some popular news channels such as Buzzfeed, CNN, Fox News, etc. All these stats prove how fast the newspaper mobile apps are becoming a choice over the print media. However, for some news channels, the cost of news app development is often a matter of concern. To clear any doubts and to learn how much does it cost to build a newspaper app, we have curated this blog. 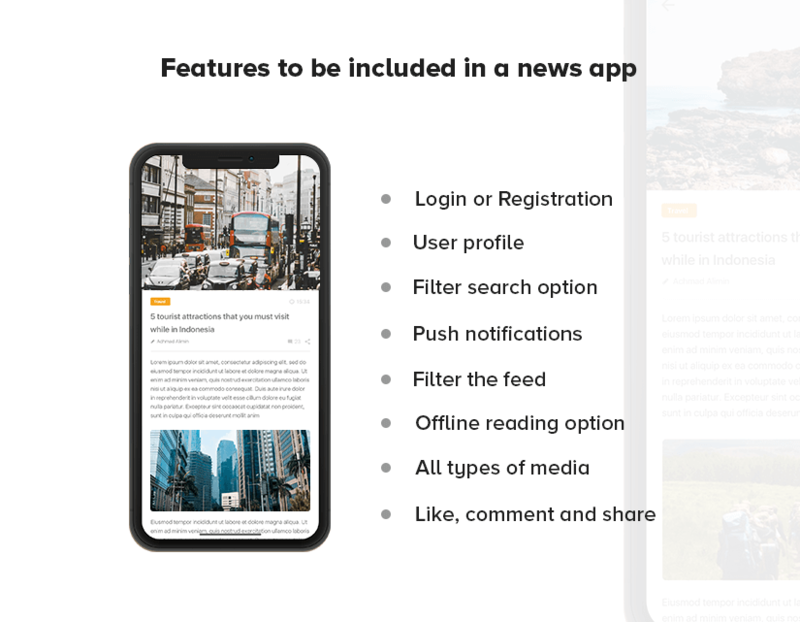 Whether you are going to make your own news app or get it developed by news app builder, you have to know the benefits you will get from the news app. 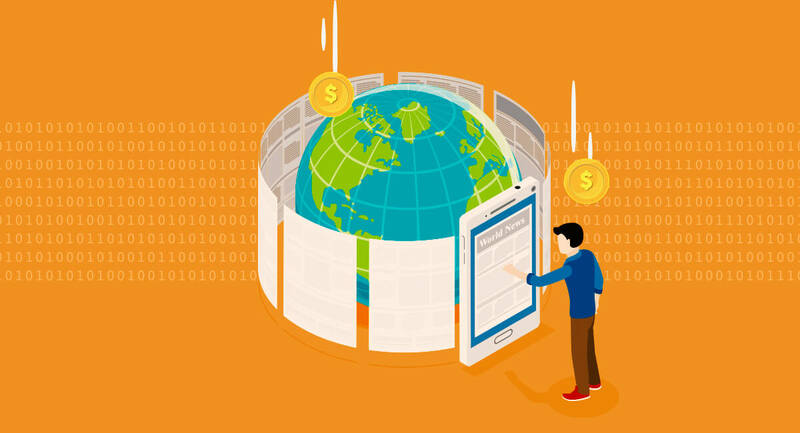 It does not matter how much money you have put in the news app development as long as it gives a good return on the investment. Just like you have a subscription for your printed newspaper, you can apply the same method to deliver quality content to users in exchange of a fee. News apps like NYTimes have this method where they offer a certain number of free article to readers and if they wish to read more than that, they have to get a subscription. Businesses have spent more than $100 billions on mobile advertisements. For any news company having a mobile app, this becomes a great source of income. Having personalised ads for businesses will get you started. It will also be a good option to choose the ads as per the reader’s interests to increase the possibility of viewing the ad. Running a personalised campaign for sponsors on your news mobile app is another way of revenue. Tickets to shows or events can be sold on the app. This can also be done for a specific location or a particular group of people having similar interests. It is sort of a given that with mobile apps the reach will increase. However, with the reach, the readership will also increase. 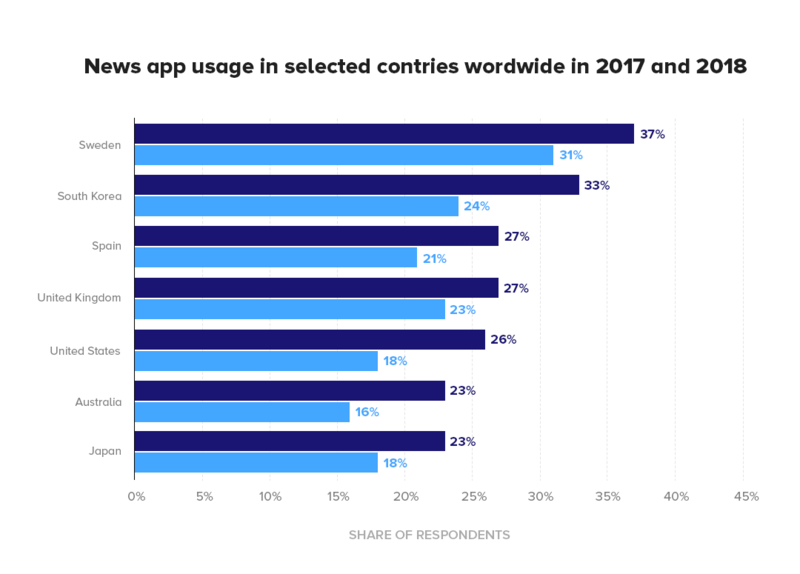 Countries like Sweden, South Korea and Spain have larger news app users. The format in which the content is displayed on apps is so much more appealing than that on the print media. The use of GIFs and high-quality images increases the chance of readership. 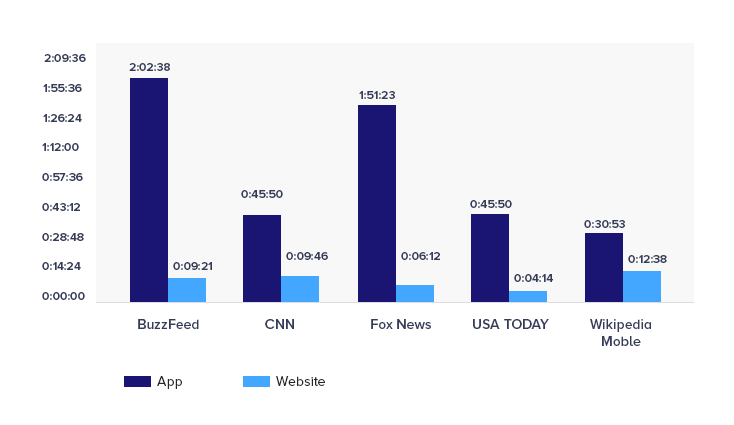 So, now you know the ROI from a news app. Let’s move on to further sections of news app development and the involved cost in newspaper app development. Which is a better choice, Android or iOS? This is the most common yet the most crucial question when it comes to news app development. The debate between Android and iOS is ongoing ever since both of these became the top platforms in the development world. When it comes to the security of the app, iOS has been a more secure platform in 2018. But Android has a larger audience so if you are going for news app development for the first time and want to get more audience immediately then Android is a choice. There is also an option to go for a cross-platform news app development which will expose you to a larger audience. Cross-platform app development will not only reduce the cost of developing a news app as compare to news app development cost for two separate apps but also decrease the time of newspaper app development. But if you wish to go for one platform only, a newspaper app for iOS will be cheaper as compared to Android news app development. If you are wondering how to make a news app for iPhone, then you can contact our team for any assistance. Since we are talking about news mobile app development, the location plays a key role. Locals are likely to be more interested in your app than far-off readers. Choosing the platform that most of your local readers are on is the best choice. To make things more simple, just go for a platform that is the most popular among your readers. 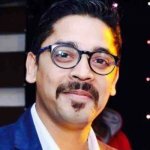 What Features Should Be Included in News App Development? Assuming that you are a first timer while getting a news app developed, we shall discuss what features contribute to making a successful newspaper app. If you are planning to build the app yourself, this 76 point checklist for app development will answer all your ‘how to develop news app’ questions. This feature is very important. The users must be able to create a profile by logging in through their email address or their mobile number. Users should also be allowed to login using any of their social media accounts such as Facebook, Twitter or LinkedIn. Allowing these social media accounts to link with your app is a wise choice as the users can easily share any news on such socials. A user profile needs to be filled by the users that will include data relevant for you. When a user has a profile it becomes easier to suggest content according to their interests and past search results. These profiles can also be used to create engagement on any of the news content, eventually increasing the reach. This feature is seen on many apps and has been loved by users. Having a filter in the search bar allows users to search specific news as well lets you know what kind of content your readers are looking for. A search can be filtered according to location, keyword, date, or latest trending news. As per the graph above, 6 out of 10 people like to read news on their mobile phones. So, to keep your readers up to date about when a news a posted or what’s the latest news update, push notification can be used. This feature sends a notification the mobile devices of the readers, letting them know what’s up in a fraction of second. This feature is also said to be one of the marketing tools as it helps in user retention. Filtering helps in what the users want to see and do not want to see. Usually, this is done by having a ‘Don’t show this to me’ option on every news post. The more optimised feed a user will have, the more time they will spend on the app. Most users prefer saving an interesting piece of content for later and for the same offline reading option should be used. This feature allows users to save content to read in an offline mode. This feature helps when there is no internet or the internet connection is slow. Words are not enough to make a piece of content interesting and that’s when images, videos, and audios come into the picture. The app should support all types of media including GIFs, PDFs, Slides, etc. This gives more flexibility to deliver the right message and express properly. This is the most common feature in any social media app and should not be eliminated in a news app. The option to engage and the ability to share a piece of news makes the whole user experience a fun one. The share option should also allow sharing on other socials like Whatsapp, Facebook, Twitter, etc. These were some of the features that a news app must include. Now we come to the most awaited section of the article and that is the cost of developing a news-based mobile application. How Much Does It Cost to Build A Newspaper Application? These points affect the news app development cost. However, the general MVP cost estimate for news app ranges between $18,000 to $20,000 for a basic app. If you wish to add any additional features, the cost may rise. A high-end news app allowing more user action costs around $35,000 to $45,000. This is not as scary as it sounds because the better the app, the more the ROI on the app. However, if you know how to develop news app for Android or iOS then you shall only pay for the tools you will be using. There are some app development cost calculators that can give an estimate of the development cost. Our team of developers knows well how to make a news app for Android and iOS. Contact our mobile app development agency to get yourself a brilliant news app. “App Store New Guideline : Cryptomining Apps to Get the Axe From Apple,�?